The PUMA® Basket Strap Glitter gives the perfect amount of shimmer and shine for the weekend! 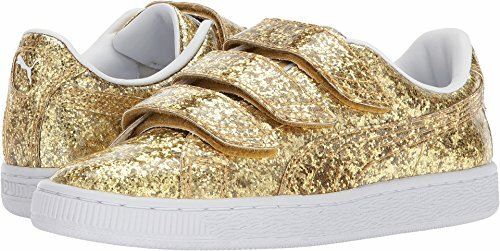 Glossy and glittery man-made uppers with a round toe. Low-cut design with a lightly cushioned tongue and collar. Three straps with adjustable hook-and-loop fasteners. Glitter PUMA Formstrip at medial and lateral sides. PUMA Basket callout at lateral side, plus PUMA Cat Logo at heel. Breathable mesh linings with an EcoOrthoLite® sock-liner offers a comfortable wear. Durable and grippy rubber outsole. Imported. Measurements: Weight: 12 oz Product measurements were taken using size 7.5, width B - Medium. Please note that measurements may vary by size. Weight of footwear is based on a single item, not a pair. The PUMA® Basket Strap Glitter gives the perfect amount of shimmer and shine for the weekend! Glossy and glittery man-made uppers with a round toe. Low-cut design with a lightly cushioned tongue and collar. Three straps with adjustable hook-and-loop fasteners. Glitter PUMA Formstrip at medial and lateral sides. PUMA Basket callout at lateral side, plus PUMA Cat Logo at heel. Breathable mesh linings with an EcoOrthoLite® sock-liner offers a comfortable wear. Durable and grippy rubber outsole. Imported. Measurements: Weight: 12 oz Product measurements were taken using size 7.5, width B - Medium. Please note that measurements may vary by size. Weight of footwear is based on a single item, not a pair.